A tinny, screechy rendition of The Beatles’ “The Fool on the Hill” doesn’t seem like cause for celebration, but Walter Isaacson thinks it’s fantastic. The music isn’t coming from a MP3 file, a CD, or even a cassette, but from an AM radio hooked up to a 40-year-old Altair 8800, one of the first personal computers. As the tune fades, Isaacson declares its Ada Lovelace’s vision in action. “Women have been written out of the history of computing,” Isaacson says. But the best selling author refuses to be complicit in it. Both his Oct. 22 talk at the New York Historical Society and his newly published book on the history of computing, “The Innovators”, highlight women’s role in computer history. It all begins with Lovelace, a pioneer of what she called “poetical science,” which combined the power of mathematics with the human imagination. An appreciation for poetry likely came naturally to her — although she never knew him, the infamous British poet Lord Byron was her father. Lovelace anticipated the ability to translate numbers and commands into music and art in 1842, over a century before a group of hobbyists programmed an Altair to sing. By the mid-19th century, England already had the Jacquard loom, which used punch cards to weave elaborate tapestries; to her poetic yet analytic mind, machines capable of even greater feats of creativity were the logical next step. Lovelace wasn’t an outlier: women were integral in creating modern computing. COBOL, an early computer language from 1959, was created and primarily used by women at the Department of Defense. Yet by the time personal computers like the Altair 8800 were being programmed to badly “sing,” the burgeoning field of computer engineering had become a male-dominated one. It’s difficult to imagine someone telling Ada Lovelace that. Dubbed the “Enchantress of Numbers” by her mentor Charles Babbage, she’s a testament to what happens if young girls are actively encouraged to study math and science. Her mother, Lady Anne Isabella Byron, saw to it that she had an extensive education in mathematics, which was uncommon for girls at the time. Ada can thank her parents’ bad marriage for that: Lady Anne taught her math in the hopes that it would keep her from developing her father’s moody, “poetical” temperament. “The Innovators” begins and ends with Ada Lovelace — both the first chapter and the final one focus on either her life in particular or how her legacy can be felt in modern computing. Since Isaacson’s last book, a biography of Steve Jobs, was an incredibly popular best seller, “The Innovators” might help get the word out on Lovelace and show the importance of encouraging the study of math and science from an early age. That reminder is still dearly needed. Lately, women are making a comeback in the field Lovelace helped to create, although they’re still distinctly underrepresented. Programs to encourage young girls to pursue STEM (Science, Technology, Engineering and Mathematics) fields have been on the rise —even the White House has gotten involved. The chief executive of MakerBot, a company that produces 3D printers, was also a guest at the talk. Her name is Jennifer Lawton, and she hopes to be at the forefront of the next tech revolution, or at least to see a 3D printer in every school. Lawton’s desire to create things and solve logical problems makes her a natural fit for such a tech-heavy business, especially one that enables people to print their own prosthetics. Just like the singing Altair, the 3D printer speaks to Lovelace’s poetical science. Like the Jacquard looms she admired, it takes data and turns it into something beautiful. 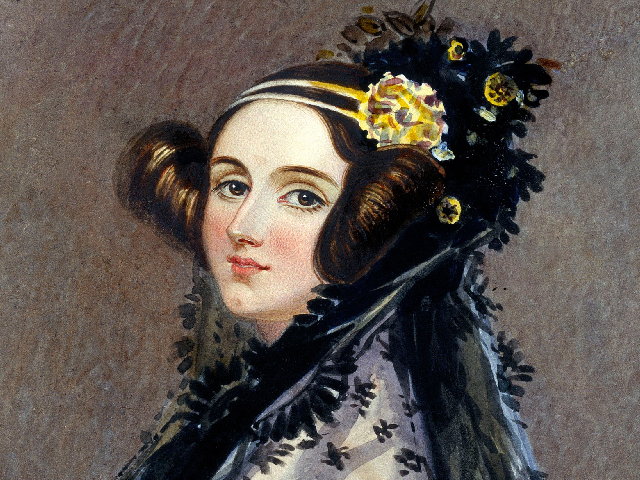 So, would Ada Lovelace be first in line for a 3D printer of her own?